2016 was a busy year for me. Bringing Terror in Ypsilanti: John Norman Collins Unmasked (TIY) to publication dominated the first half of the year. On August 1st, Wheatmark Publishing, Inc. brought out a quality paperback edition of TIY and a digital ebook edition. I direct-marketed the book as well as offering it online at Amazon, B&N, and ebook formats--notably Kindle, Nook, and KOBO. My year ended with selling the option for the digital-audio rights to Tantor Media, a publisher that distributes audiobooks in English-speaking countries worldwide. For being an independently published book, I'm more than pleased with the reception TIY has received. Reader response has been overwhelmingly positive. One of my original goals was to get this shadowy story out to the public with the facts as they are known. That I have done. 2017 is shaping up to be another busy year. Most of my book talks last year were in Southeastern Michigan around the Detroit area. Only now am I beginning to work the San Diego County market. Being able to drive to an appearance, give the talk, and return home cuts my overhead expenses considerably. Friday, February 3rd - the LIFE @ San Elijo program at San Elijo Campus of MiraCosta College, 3333 Manchester Ave, Cardiff CA 92007. Building 200 is the most westerly on the campus. Parking permits aren't required on Friday afternoons, but please do not park in a spot marked “Staff.” 1:00 pm until 2:30 pm, Encinitas, Calfornia. Monday, February 6th - San Diego Educator Association (Ret.) 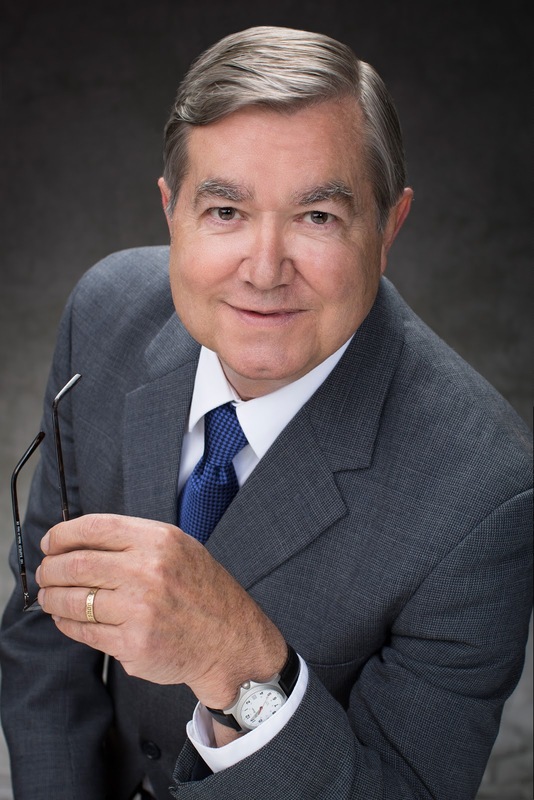 featured speaker at their quarterly meeting luncheon at 11:30 am. San Diego, California. Saturday, March 11th - Tucson Festival of Books on the campus of University of Arizona at 2:00 pm. Meet and greet book signing at Wheatmark Publishing booth. Tucson, Arizona. Saturday, April 22nd - La Jolla Public Library, San Diego, California, from 2:00 pm until 3:00 pm. Thursday, May 11th - Ypsilanti District Library, Ypsilanti, Michigan, from 6:30 pm until 7:30 or 8:00 pm. This year's presentation will be different than last year's talk. Saturday, May 13th - Ann Arbor Barnes & Noble book signing, Washtenaw Avenue, Ann Arbor, Michigan, from 1:00 pm until 3:00 pm. Sunday, July 16th - Book Club of Detroit's First Annual Detroit Festival of Books at the Eastern Market from 10:00 am until 4:00 pm. I've been very happy with the overall reception of TIY. Direct sales of autographed copies from my author website have been good, and my Amazon sales are strong. TIY reached #4 on Amazon's Biography/Memoir/Regional/Midwest category, despite splitting the market with the online retailing giant. Kindle and other ebook versions have been selling well also. Since the presidental elections, the holidays, the inauguration, and the shifting of the setting sun, sales have moderated, but with the lengthening days, my outlook for 2017 is optimistic. The radio success of The Lone Ranger program was phenomenal. It ran from January 30, 1933, through September 3, 1954, for a total of 2,956 episodes. The Lone Ranger brand name was a merchandising bonanza. Soon, novels, comic books, jigsaw puzzles, authentic hats, masks, Western style shirts, and replica twin gun and dual holster sets with silver bullets were available in every toy store in America. George W. Trendle, founder and general manager of WXYZ Radio in Detroit wanted to bring The Lone Ranger to the new medium of television in 1948. Brace Beemer had played the title role on radio for eight years and wanted the television part. Trendle felt that Beemer was too long in the tooth and sat too low in the saddle at forty-six-years-old for the role. Brace didn't have the square jaw and rugged good looks that the role required. George W. Trendle watched numerous Western and adventure movies and liked Clayton Moore's versatility as an actor. Moore had extensive film, movie serial, and television experience. The white hat and the black mask looked good on Moore. 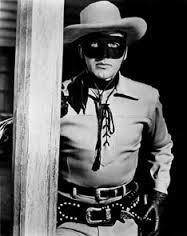 The Lone Ranger jumped off the small television screen and into America's living rooms on September 15, 1949. In all, there were two-hundred and twenty-one episodes made. The third year of the series found Clayton Moore sitting out the season because of a contract dispute. Another actor, John Hart, donned the uniform. The mask made the transition to a different actor easier for the audience to accept, but Hart didn't move the same way, nor did his voice match. And something was different about the chemistry between the masked man and Tonto. The first few episodes with the new Lone Ranger were shot in documentary style with a narrator to ease the transition to the new voice. Hart was generally accepted in the role, but fan favorite, Clayton Moore was back in the saddle for the fourth and fifth season, the only one shot in color. In addition to a fatter contract, Moore wanted meatier roles to stretch himself as an actor. He liked playing the classic, two-dimensional good guy, but it wasn't enough. To take advantage of his acting ability, Moore began playing dual roles as the Lone Ranger going undercover. Sometimes he was an old prospector or a vagrant of some kind. The character became a master of disguise and infiltrated gangs and outsmarted the bad guys. No more episodes were made for television after 1955, but the show was so popular with the audience that it managed to hold on to its time slot through the 1957 season. Through it all, Jay Silverheels, a Mohawk Indian actor, played the role of Tonto, the masked man's trusted companion. The Lone Ranger always used perfect grammar, which may have pleased parents and English teachers, but it didn't seem to make much of an impression on Tonto. The Lone Ranger was his "kemo sabe," his trusty scout. In later years, Jay Silverheels made an appearance on The Tonight Show, with Johnny Carson, and was asked about Tonto's clipped dialogue. He said it bothered him, but that's what the script required, so he read the lines. When his role as Tonto ran its course, Silverheels played minor supporting roles in the movies and on television into the early 1970s. He enjoyed harness racing in his later years and actively spoke out about the "Uncle Tomahawk" roles Indian actors were forced to play. 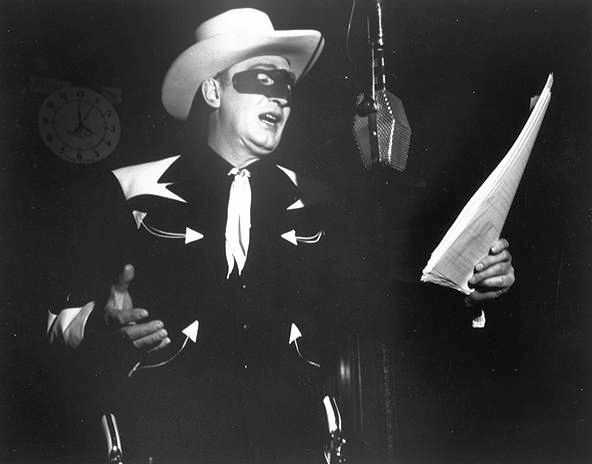 Clayton Moore continued to make appearances as the Lone Ranger for the rest of his public life. In 1979, he was banned from wearing the mask at appearances because of a new Lone Ranger movie that was to come out in 1981. The producers took out a court order against the aging but beloved actor. It was a public relations disaster for the film which tanked at the box office. Clayton Moore got so much free publicity that he started making appearances in some specially designed Foster-Grant sunglasses and landed a fat endorsement contract. "Who is that man behind those Foster Grants?" began the successful ad campaign which played on the signature ending of each television episode, "Who was that masked man?". His commercials aired repeatedly which delighted fans, proving that you can't keep a good man down. In 1984, the court order was lifted and Moore could once again wear the mask while making appearances. By the 1990s, Clayton Moore retired from public life. The Lone Ranger! "Hi Yo Silver!" "A fiery horse with the speed of light, a cloud of dust and a hearty 'Hi Yo Silver!' 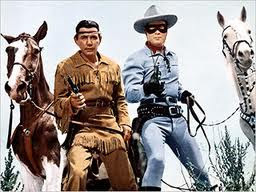 The Lone Ranger--with his faithful Indian companion Tonto--the daring and resourceful masked rider of the plains led the fight for law and order in the early west. Return with us now to those thrilling days of yesteryear. 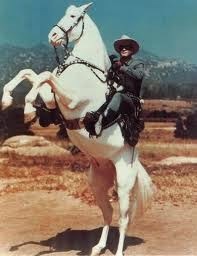 The Lone Ranger rides again!" Baby Boomers everywhere will remember those rousing words recited over Rossini's classical music The William Tell Overture. 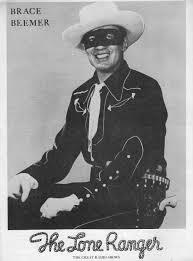 The television version of the masked man hit the small screen in a big way, but the character was already well-established on a radio show first broadcast from Detroit three times a week on WXYZ radio in 1933. Fran Striker was the creator of the character; George W. Trendle was the producer of the show; and Earl Graser was the first Lone Ranger on the radio. Graser had a deep, authoritive, vibrant voice that sounded much older than his thirty-two years. On his way home from rehearsals at the station on April 8, 1941, he fell asleep at the wheel and veered into a parked trailer silencing one of America's most popular radio voices. He had been on the air as the Lone Ranger for eight years. The show was scheduled to air the next night, but who would take over the role? Trendle had to find someone fast. Mike Wallace might work. 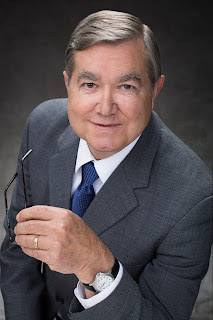 He would become a journalist on Sixty Minutes decades later, but he was presently the narrator on the popular The Green Hornet program at WXYZ. Mike Wallace was available, but he had questionable dramatic voice acting ability. 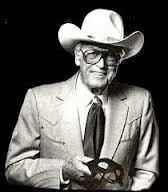 It was decided that Brace Beemer, who narrated The Lone Ranger, was their best choice on short notice. He had already been doing publicity photos for The Lone Ranger, and now he could make public appearances around the Detroit area as well. Best of all, Beemer's voice was similar to Graser's with a slight headcold. Good enough! To ease the transition for listeners, the masked man would be wounded for the next few episodes and speak with a weak, raspy voice. Brace Beemer was an excellent front man for the program. He was six feet tall, handsome, and an excellent horseman. He had no problem booming out "Hi-Yo, Silver"during the program, but he couldn't handle the ending when he had to say "Hi-Yo, Silver, away." It didn't sound right to Trendle or the sound engineers, so they inserted a recording of Graser saying the line at the end of the program. In a 1944 radio poll, The Lone Ranger placed number one in popularity. In all, there were 2,956 radio episodes made. Michigan tornadoes since 1950 when records began being kept. A tornado is a violent rotating column of air descending from a thunderstorm and touching down on the ground, usually spinning counterclockwise in the Northern Hemisphere. There is no shortage of tornadoes in the deadly swatch of America called "tornado alley"--a nickname given to a large area beginning in Texas and running through the Great Plains states northeast through the Midwest and the Great Lakes, stretching into Canada. The official boundaries are not clearly defined. The term was first used in 1952 as the title of a research project by U.S. Air Force meteorologists Major Ernest J. Fawbush and Captain Robert C. Miller. Tornado season runs from mid-March into September--the worst month being June. Allen Park, Michigan, is located south of Detroit in an area known as Downriver--statistically a low risk area for tornadoes. But on May 12th, 1956, the day before Mothers' Day, an F4 tornado ripped through town and injured twenty-two people, damaging property in its wake. An F4 rating is listed as "devastating" [207 mph to 260 mph] by the National Oceanic and Atmospheric Administration [NOAA]. Tornado ranking was developed by T. Theodore Fujita and first used in 1973 and enhanced in 2007 [see link for more detailed information]. Allen Park residents remember the 1956 tornado as one of the worst weather events in their history, the twister touching down on Ecorse Road and cutting across town. Eyewitnesses remember that it traveled down the railroad tracks near homes close to Jaycee Park. There was damage to the Westwood Dairy Bar at Allen Road and Roosevelt Street. Also on Allen Road, Gee's Drive-in hamburger joint had the roof torn off which landed in a yard several blocks away. 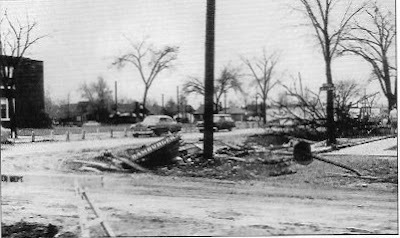 Across Allen Road, the tornado took out all the front windows of North Junior High School, and close by, all the trees in Thomas Park were leveled. This was a lucky day for Allen Parkers, only twenty-two people were injured with no fatalities. Flint, Michigan, had a tornado the same day with three fatalities and one-hundred, sixteen injuries. Only three years before, the Flint area had an F5 tornado, the most devastating tornado in Michigan state history--with one-hundred, sixteen deaths and eight-hundred, forty-four injuries. The modern circus clown character was created in the 19th century. These performers used broad physical comedy, often in mime (without voice). Circus clowns were known for their distinctive makeup, outlandish wigs, colorful oversized costumes, and exaggerated footwear. They provided diversion for circus crowds while roustabouts set up for the next act which might involve animals or featured performers. Clowns would weave in and out of the spotlight to create an atmosphere of safe fun for their audience. Circus clowns perform strictly for laughs and to entertain their audience--heavily loaded with children. Their ridiculous antics deal with the absurdities of everyday life and speak to the human condition. Traditionally, clowns are archetypal figures that appear in many of the world's cultures performing a vital social function--a comical diversion from the stress and strain of everyday life. The village idiot character lost popularity in America in the early 20th century. The North American circus began to develop new comic characters like the hobo and the tramp. Charlie Chaplin made a career out of the tramp character in the silent film industry. 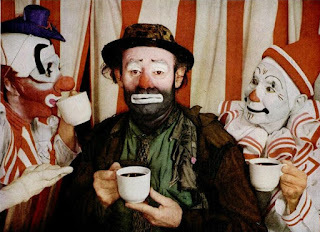 Emmett Kelly's clown character Weary Willie was developed in the 1930s based on Depression era hobos. In early television, Red Skelton portrayed Freddy the Freeloader, a smart-mouthed bum with a heart of gold who could find humor and humanity in any situation. Most Baby Boomers remember Clarabell from the Howdy Doody Show and Bozo the Clown who premiered in 1960 with his own cartoon show. 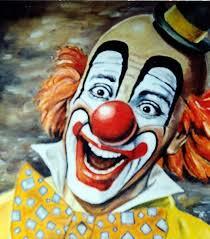 The Bozo character was franchised and Bozos starting appearing in large media markets across America. These signature clowns hosted local shows with a live studio audience of screaming kids interspersed between cartoons. In 1963, weatherman Willard Scott portrayed the first Ronald McDonald, which quickly became the company's trademark mascot. Because of changing times and different sensibilities, McDonald's recently retired Ronald after 45 years of faithful service. The trend of birthday clowns began in the 1960s and was popular throughout the 1970s. By the end of the 1978, a registered clown in the Chicago area entertained at kid parties and community events under the name of Pogo the Clown. 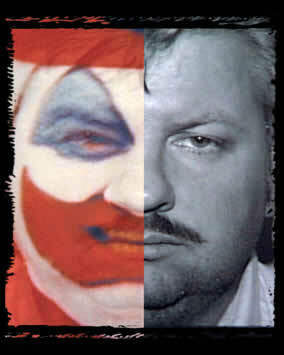 When he was arrested at his home, John Wayne Gacy had sexually assaulted and killed 35 young men. Coast-to-coast newspaper accounts called Gacy the "Killer Clown." What scared parents most... Gacy was given easy access to children under the guise of an innocuous clown. This fueled American's growing fears of "stranger danger" and clowns became the objects of real suspicion. 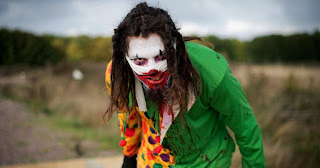 Professor Andrew McConnell Stott of the University of Buffalo believes Charles Dickens invented the scary clown in The Pickwick Papers (1836). Dickens describes an off-duty clown who is a alcoholic that destroys himself to make audiences laugh. Dickens made it difficult for his readers to look at clowns without wondering what was going on beneath the makeup. In Batman comics #1 in 1940, supervillain The Joker debuted as a psychopathic clown with a warped sense of humor. Joker was the archenemy of The Caped Crusader. The 1980s gave rise to the "evil clown" character popularized by Stephen King's novel It (1986). Television clowns like "Homey the Clown" on In Living Color and "Crusty the Clown" on The Simpsons forever changed the way Americans view clowns. In recent years, psychologists have coined the term coulorphobia for the fear of clowns. Movies like Killer Klowns from Outer Space (1988), Clownhouse (1989), and the Saw movie franchise (2004) only aggravate the condition. The great clown scare of 2016 started in August in Green Bay, Wisconsin. With the help of social media and YouTube, Crazy Clowns and Killer Klowns started pranking kids across America causing hysteria among parents and their children. Many schools banned clown costumes at Halloween functions this year. With this kind of media exposure, today's kids do not have the safe-fun context once associated with clowns. Whether clowning as a profession can survive this recent trend of bad publicity lies with the prevailing public perception. These are complicated times we live in, and Americans are more fearful and cautious of strangers in any guise. Clowns have fallen on hard times.